LIA is the local, authorised distributor of the Lean Enterprise Institute (LEI) in the USA and as such, distributes books, DVDs and training materials on behalf of the LEI. As prices are dependent on the exchange rate we have not included them on the webpage. To view Lean Enterprise Institute books please follow the link www.lean.org/Bookstore/ and browse the site. Please contact us on 021 406 1477 or leaninfo@gsb.uct.ac.za for further information or to place an order. 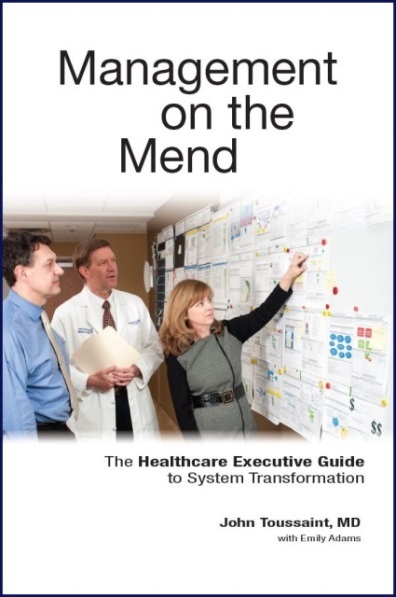 Dr Toussaint recently r eleased his third book ‘Management on the Mend: The Healthcare Executive Guide to System Transformation’. It provides a comprehensive view of the framework required for Lean Transformation illustrating learnings from proven systems, and methods for enabling frontline caregivers and leaders to expose and eliminate problems plaguing service delivery in healthcare. 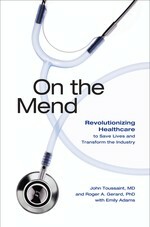 In On the Mend: Revolutionizing Healthcare to Save Lives and Transform the Industry, the authors, John Toussaint and Roger Gerard, talk to us about Thedacare’s lean journey. Within their hospital group, they decisively confirm the case for evidence-based delivery of care, a concept that goes hand-in-hand with evidence-based clinical medicine. Thedacare (now Catalysis) is a mid-sized, not for profit healthcare provider in Wisconsin. They manage hospitals, clinics and nursing homes. Dr John Toussaint was the CEO of Thedacare during the implementation of lean and Roger Gerard the Chief Learning Officer. The combined views of an expert in organisational development and clinical practitioner turned manager makes for unique insights into the process of change. 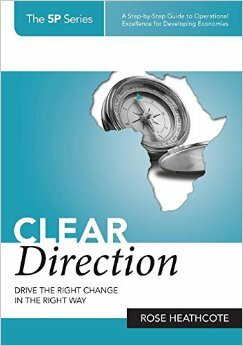 Review written by Jimmy Psillos, CEO of Crystal Candy in Zimbabwe who is actively involved with the Confederation of Zimbabwe Industries and chairs the Economics and Banking Committee of the chamber. Zimbabwean businesses are struggling to compete in a very tough business environment. Finding an effective turnaround strategy is something much needed for many businesses in Zimbabwe. Increasing productivity and lowering costs are fundamental to being able to compete commercially, both locally and internationally. Art Byrne is a master of strategising and implementing business turnarounds. He specialises in buying struggling businesses and ‘turning them around’ using Lean leadership and filtering lean thinking and practice throughout the organisations. 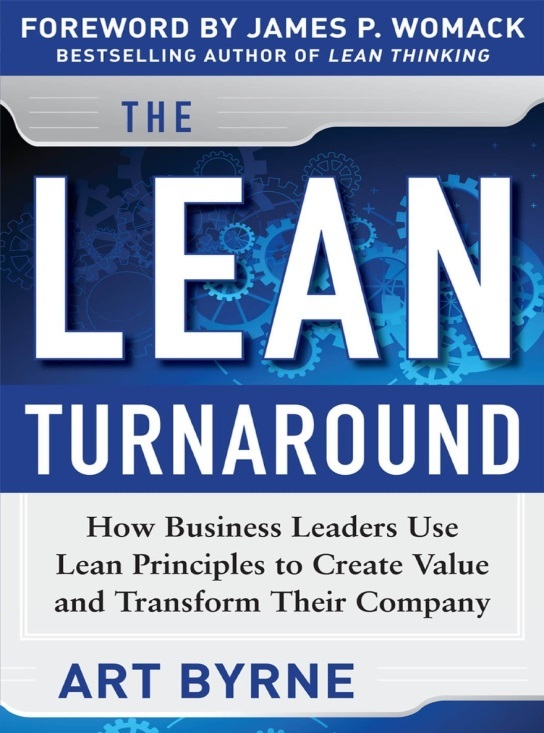 In this engaging book, Byrne gives an excellent overview of the recommended steps that are required to institute a lean transformation in any business. Byrne takes the reader through a lean transformation journey, highlighting the key steps to take and the pitfalls to avoid. The examples that Byrne gives of the value created from previously struggling businesses are, in my opinion, mind-blowing. This is a valuable read for any leader seeking to understand the benefits of lean management and how lean techniques can form the basis of an effective turnaround strategy for business. The book has inspired Jimmy to begin and lead a lean journey at Crystal Candy. They have engaged local consultants and have started a pilot in one department. 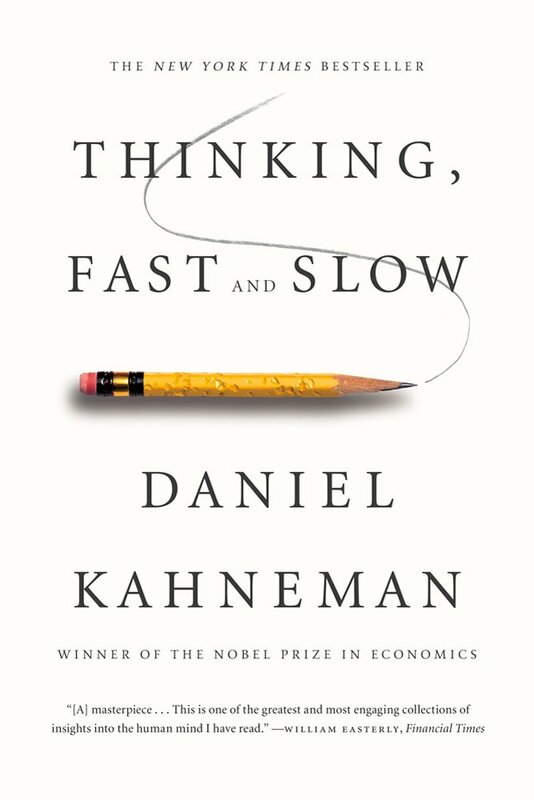 Thinking, Fast and Slow written by Daniel Kahneman, winner of the Nobel Prize in Economics, is a summary of Kahneman’s research conducted since the early 1970’s in collaboration with Amos Tversky (died 1996). Thinking, Fast and Slow offers a psychological basis for reactions, judgments, recognition, choices, conclusions, cognitive biases, fallacies and illusions. In short, the book is about how the different systems of our brain work whilst we are thinking. Kahneman and Tversky did extensive research on the difference between the two systems of thinking. System one is fast, automatic, intuitive and largely unconscious. System one uses association, heuristics and other metaphors to produce a quick view of reality. On the downside this system’s thinking is often faulty and biased. System two is the more deliberate, analytical and largely conscious mode of interpretation. Unfortunately system two suffers from ‘ego depletion’ and is content to accept the fast, inaccurate reality provided by system one. In Toyota Kata Mike Rother shares knowledge and insight gained while working at Toyota and learning the Toyota approach to management. 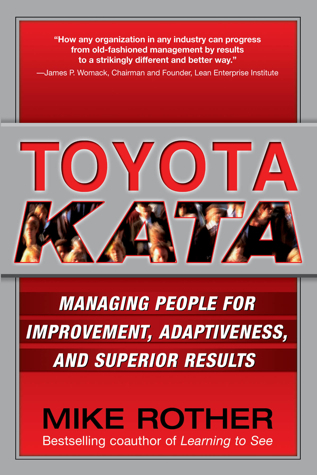 In this book ‘kata’ refers to the organisational routines that in Toyota allows for continuous improvement, adaption and employee empowerment. Rother is able to demonstrate and support how these routines are sustained at Toyota. Improvement Kata: a habit of continuous cycles to establish target conditions, working step-by-step through obstacles and learning from the problems encountered. Coaching Kata: a habit of coaching employees at every level to think and act in the Toyota way. 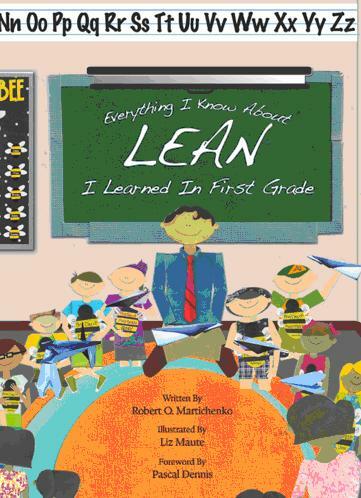 In Everything I Know About Lean I Learned In First Grade, author Robert Martichenko takes us back to Grade 1 to remind us about the first time that we were unknowingly exposed to the lean philosophy. This is perhaps why those who have never ‘unlearned’ these lessons taught at primary school find lean such a natural extension of what they do in their everyday lives. Everything I Know about Lean I learned In First Grade reminds us that lean is about nurturing a learning culture with thinking people. In the book Martichenko highlights the key principles found in schools and lean organisations including visual management, 5S, root cause analysis, scheduling, planning, clearly communicating expectations and focusing on the basics. He reminds us that it is not the tools, but the reasoning behind the tools that makes the philosophy work. In Managing to Learn, John Shook describes the A3 as a core lean management process. The book succeeds in simultaneously providing two perspectives on learning about the A3 process. Desi Porter, a recently appointed manager, versed in the lean basics is tackling his first A3. Readers join him on his journey to discover A3 content and meaning. At the same time readers see through Ken Sanderson’s perspective, Porter’s A3 coach and manager, as he guides Porter in his A3 journey. 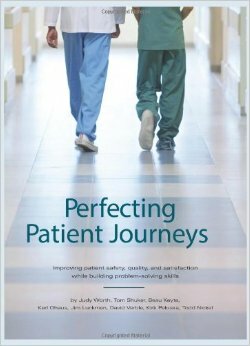 Perfecting Patient Journeys by Judy Worth, Tom Shuker, Beau Keyte, Karl Ohaus, Jim Luckman, David Verble, Kirk Paluska and Todd Nickel.